As he nears retirement, L.A. County CEO Bill Fujioka reflects on 40 years of public service. Although retiring on Dec. 1, Fujioka said he will continue to work. “I’ll quit this adventure and go on to the next adventure,” he says. Bill Fujioka started his career in public service as a custodian for Santa Cruz County, while studying at UC Santa Cruz. Forty years later, he is the chief executive officer of Los Angeles County, charged with managing a budget of $37 billion and working with the county’s 105,000 employees. It’s been quite a journey for a Sansei kid from the Eastside. On Dec. 1, he’ll be calling it quits and starting a new chapter in a remarkable career. Fujioka was appointed CEO of L.A. County in 2007, becoming the first Asian Pacific Islander to hold county’s top position. His leadership helped to steer the county through the turbulence and economic uncertainty of the Great Recession. 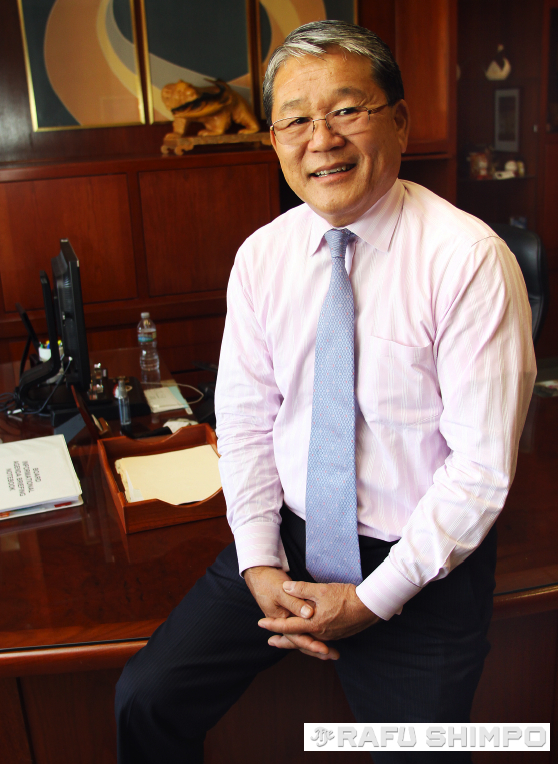 Los Angeles County CEO Bill Fujioka at his office in downtown L.A. He will be retiring on Dec. 1. In turn, he credited the five-member Board of Supervisors for making difficult decisions, pointing to three straight increases by the major bond rating agencies during the recession. He also praised the county’s department heads for finding ways to maintain services during a time of fiscal austerity. “Every department took about a 17 percent reduction. The department heads in the county were absolutely incredible, what they were able to do with less and still maintain our services,” he noted. In his final $26.4 billion budget for L.A. County, Fujioka reported a surplus showing both higher property tax and sales tax revenues. Besides repairing infrastructure and adding more employees, including 100 child social workers, Fujioka has recommended that L.A. County build a 10 percent reserve fund over time. The recession wasn’t the first time Fujioka has been in charge during a crisis. He was in charge of the emergency room at L.A. County USC Medical Center in 1992 when the riots erupted. Fujioka has worked as hospital administrator/chief executive officer at High Desert Hospital, and earlier as CEO of Coastal Cluster Health Centers, a network of eight public health centers in the South Bay. In 2007 then-L.A. Mayor Richard Riordan appointed Fujioka to become the city’s chief administrative officer, the first API to hold the position. Fujioka is married to Darlene Kuba and has a son Jason, who lives in San Jose. He credits his mom Linda with instilling a strong work ethic in her kids. “My mom is 86 and she still teaches school. So she is our example, she’s our inspiration. She is what people talk about when they talk about role models,” Fujioka said. Fujioka was born in 1952 in Boyle Heights to Willie and Linda Fujioka. He grew up in Montebello, and was recently inducted into Montebello High School’s Hall of Fame, along with his brother Fred, a Superior Court judge. His grandfather Fred Jiro Fujioka was a prominent businessman prior to World War II, owning the largest Oldsmobile dealership west of the Mississippi. On the morning of the attack on Pearl Harbor, Fred was among the first to be picked up. He had donated to relief efforts after the Tokyo earthquake of 1923 and was honored by Emperor Hirohito. “The emperor gave him a sword and medals. Grandmother took them and hid them. As a consequence he was charged with being a war criminal but never prosecuted. He lost everything, an absolute fortune,” Fujioka said. Fujioka’s father Willie served during World War II in the 100th Battalion and 442nd Regimental Combat Team, earning a Bronze Star and Purple Heart. 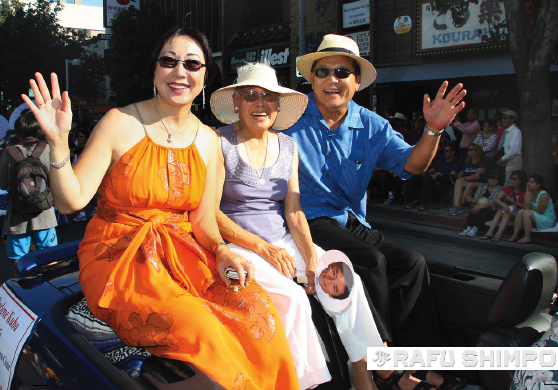 Fujioka, joined by his wife Darlene and mom Linda, ride in this year’s Nisei Week Grand Parade. The experiences in battle left Fujioka’s father with unseen scars. Willie’s cousin Stanley Hayami, who served alongside Sen. Daniel Inouye, was killed on the last day of the war. Hayami was the subject of a book and the film “A Flicker in Eternity.” Fujioka said that the late senator was Hayami’s platoon sergeant and would remember him on the occasions when they spoke. “It was a lousy way to go. There probably was a sniper out there. He went out to provide medical aid and a sniper goes and shoots him,” Fujioka said. Out of the tragedies of war and incarceration, the message given to Fujioka by his family was clear. “What happened with the war, relocation, my dad and mother’s generation, the stigma, families losing so much. The message we always got is you have to show people what we can do. You have to show them your pride and your honor,” he stated. He laughed when he said his mom used another motivation to keep him on the right path. “She said if I did anything stupid you’ll be on the front page of The Rafu!” Fujioka said, smiling. The Board of Supervisors will honor the retiring CEO on Tuesday at their regular meeting. A retirement dinner for Fujioka held in Universal City earlier this month was attended by more than 1,000. Even as his retirement draws near, Fujioka remains focused on the job at hand. After retirement, Fujioka said he may write a book and do some consulting. But he says he has no intention to stop working. “I think I have 20 productive years left,” he said. “I’ll never quit working, I’ll quit this current adventure and go on to the next adventure.